For those gigging or rehearsing occasions when you need to take along just your snare drum and bass pedal(s) these two lightweight and waterproof dedicated cases fit the bill superbly. Very rugged construction with lots of protection for your gear. Ideal for gigs where you're packing light. Useful for public transport. It won't make your gear lighter! Walking back through town just now we watched this young drummer struggling along with his monster cymbal bag on his back. It's an increasingly common sight in austerity UK, where driving is prohibitive and parking worse. Rehearsal rooms rise to the task with backline and kit supplied - just bring your cymbals and sticks, and maybe your snare and bass pedal(s). Hence these two new cases from Protection Racket, which are back packs designed to accommodate snare and single or double pedals. Protection Racket is a great UK success story. Its products are everywhere and have a deservedly top reputation. "These packs feature thick padded shoulder straps and padded backs for comfort"
Why? Because they are fabricated to be almost indestructible while being lightweight, good looking and waterproof, with bullet-proof nickel-plated steel zips. The underlying structure of all Protection Racket cases consists of the three layers of Racketex polyester outer, Propadd shock-absorbing foam, and inner cosseting Propile artificial fleece, all double-stitched with nylon. 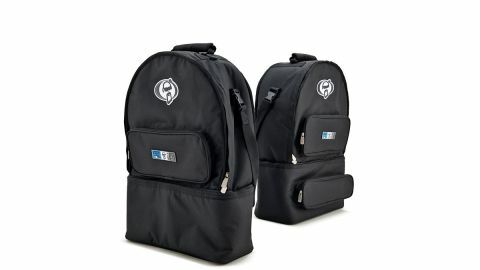 These packs feature thick padded shoulder straps and padded backs for comfort, a carrying handle on the top lid, and a midriff-hugging belt with quality buckles. Both cases have the same basic design. But the double case has an internal divider for your double pedal where the single one doesn't. On the lower outside it also has a compartment for the pedal connecting rod, etc, which the single case does not. That said, you could conceivably get your double pedal in the single case if it is a simple, lightweight one without a fixed baseplate, etc. Both cases allow you to squeeze in a snare up to 14"x7", although since there is a thick extra Propile fleece divider/protector, 14"x6½" is more realistic and then you could get spare heads, or even your hi-hats safely tucked away the other side of the divider. Additionally there are 14"x6"x1" zipped pocket accessory pouches on the front of both cases. which could hold brushes or spare snare wires. The snare and pedal halves of each case have zippers around three sides, leaving the fourth, back side permanently stitched. Thus the two halves hinge, which greatly eases getting the pedal in and out. But since the halves are permanently joined on the one side you can't misplace either half-case. For extreme testing purposes we inserted a heavy steel 14"x7" monster snare, squeezed in some 14" hats and a double pedal (not the heaviest by any means), just to see how unwieldy the whole shebang would be. Heavy is the word. But far from unmanageable. You might not want to hike miles with it, but you could certainly board the bus or train and get around town with it.